You do not have to “spend down” most or all of your assets before obtaining government benefits to help pay for nursing home care. Equally important, you do not have to be poor to be eligible and benefit from Medicaid. The Medicaid application process does not have to take months or years, and having recently transferred assets does not necessarily disqualify you — even after recent changes in the laws. These are just a few of the many misconceptions we clear up if you contact us today for help with Medicaid planning or qualification. At The Levinson Firm, LLC in Wilmington, led by attorney Karla Levinson, we can help your loved one in need of long-term care qualify legally, honestly, and quickly under Delaware Medicaid law — even in a crisis situation. Our lawyers and staff know current state Medicaid laws extremely well, and we can also provide full Medicaid planning and asset protection planning services so that you are financially protected if you need to apply in the future. We Provide Full Service Medicaid Assistance, Including Handling Your Application. Many attorneys may talk with you about Medicaid and other government benefits, suggest a plan, and send you on your way to file the necessary application. We go much further by completing the application for you and sticking with it through final approval and dealing with any complications that arise. 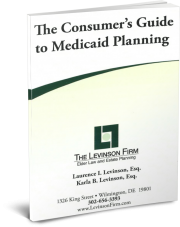 Many of the Medicaid planning strategies we apply to help ensure our clients’ eligibility and protect assets have been used by The Levinson Firm, LLC effectively for hundreds of our clients over the years.